The early spring-type clutch flywheels are of no use except where total originality is required on a concours car. The taper is too small and diaphragm pressure ring non-existent. No use to man nor beast. With the exception of the fact the two-piece flywheel is two pieces bolted together - this and the later one-piece cast item can be treated as the same thing. They will universally fit all transverse engine cranks from 1964 onwards, so that should be easy enough. If all you can get is the hulking great 1300 type, then this too is as universal to fit, but I highly recommend you get that extra cast lump machined off of the outer edge as a bare minimum. Further lightening of these cast flywheels is possible by having metal machined off of the diaphragm side, from the outer edge of the diaphragm pressure ring outwards. A safe amount is 0.200". I have taken considerably more off, but wouldn't generally recommend it - the 0.200" is enough to make a big difference. Keep a note of what thickness of material is removed, as you will need to fit spacers under the clutch straps to maintain the correct fitted height. I generally use 3/8" flat washers. - Place the clutch plate in position, with the protruding primary gear spline boss on the underside facing the work surface. - Place the flywheel in position. - If the drive straps are holding the flywheel up, or are under tension pressing on the pressure plate 'horns', more spacer-washers/shims are needed between the drive straps and flywheel. - If there's a gap between the drive straps and pressure plate horns, the spacing between the straps and flywheel needs reducing. - If no drive straps are fitted, using a straight edge or drive strap fitted to one of the horns, measure the existing gap between flywheel surface and underside of straight edge/strap, and make suitable spacers to this measurement. The idea is set the straps so that when in 'as assembled' position, they are not under tension, nor are well clear of the pressure plate horns. They should be JUST touching. Under tension the clutch will slip due to decreased clamping pressure. Too far clear may cause disengagement problems. Marking the timing marks on the outer edge of the flywheel adjacent to the original marks prior to machining will allow them to be re-marked afterwards. And if you are very friendly with the engineering company, material is removable from the clutch plate side too. Check out the diagram for details. BUT, and a big BUT, these are only suitable up to fast road use. High rpm use, even if only occasional, can see them shatter. Believe me, you do not want lumps of cast iron visiting you in the cockpit having just left the crank at 8,000rpm! Even more weight-saving can be achieved by the fitment of the automatic Mini ring gear (part no 22G2613) as this is much thinner than the standard manual one - 0.343” thick instead of 0.500” - therefore lighter; most importantly where it counts - on the outside diameter. This will also allow the ring gear register to be machined down to the thickness of the thin ring gear. From here we go to the specially produced flywheels turned from billets of good quality steel. Until recently there was only an ultra-light version available (well, two actually - more of this later) until Mini Spares fulfilled the desire of many by producing a street version of the ultra-light item. Essentially an ultra-light steel flywheel without the outer lightening slots machined in. Both types are fitted with the lighter ring gears as standard. This neatly filled the gap between serious road use and occasional sprints and hill climbing and full race use without the alarming possibility of mid-race appendage removal by flying iron debris. For direct weight comparisons of the aforementioned, consider the table below. *Note - this is the safest recommended weight with above machining details. See 'Flywheel & Pressure Plates - Effects of lightening' for benefits of lightening. For years there was more or less only one ultra-light version available. During development of harmonic dampers, Mini Spares came across some odd harmonics on the engine they were using as a test bed. It was causing inconsistent harmonics up and down the rev-range that were potentially failure-inducing of the whole crank assembly. And something that a harmonic damper would not necessarily totally arrest. 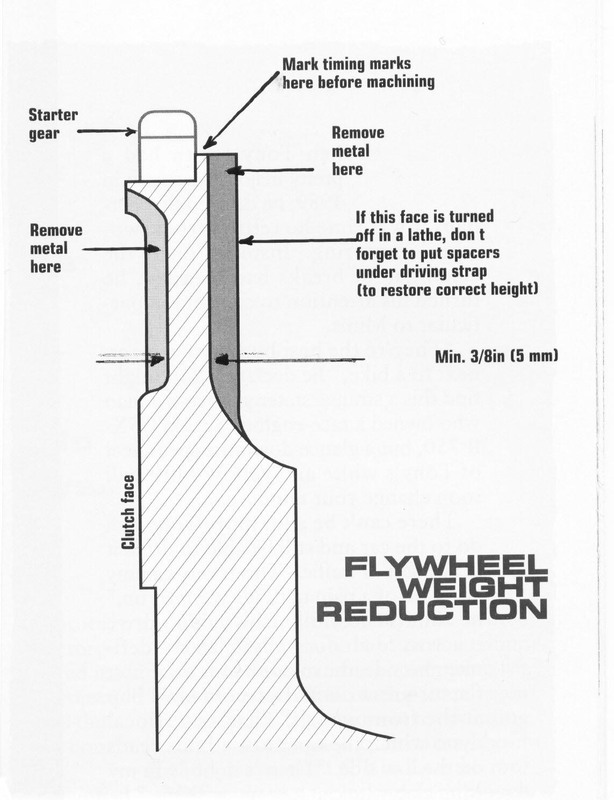 Investigation with a strobe highlighted the outer section of the flywheel flexing, caused by the extended thin section of the outer edge/ring gear. So they made their own, splitting the original three long slots and three round holes into six even slots. Problem solved!! This also allowed them to address consistency problems experienced by the then lone supplier such as incorrect crank taper and clutch face angles. - For all race applications, and big output road units, use THREE clutch straps for each location on the pre Verto set-ups. This eliminates strap stretch and horrid vibrations. - If you have the friction face of the pressure plate re-machined to make it flat, make sure the exact same amount is machined off of the three ‘horns’. Failure to do this will mean severe clutch slip and ineffective disengagement. -On performance road cars to help prevent fretting/fusion-welding of the flywheel to the crank, torque the flywheel bolt up to 125lb ft. Use only decent flywheel bolts - definitely no cheapy foreign jobs! -On race engines the above procedure should be observed, except I always do this three times, rapping the flywheel with a dead-blow or copper mallet against the clutch spring ridge between each re-torque. May not be the ultimate, but I have NEVER had a problem doing it like this - and I've seen all kinds of rituals observed for this one!